Travel is becoming more and more hectic as security concerns and increasingly crowded planes put a cramp in anybody’s style. But you can almost always escape the frenzy – at least for a short time – by finding “out of the way” places to sit and relax in most airports. 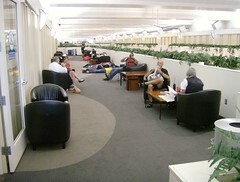 Here, at MSP in Minneapolis, travelers are enjoying very comfortable seats in a very quiet area of low foot traffic just above the bustle of the main terminal. Finding such gems in big airports can be a chore, so it’s often best to ask at the information desk (or consult the Airport guide or map) to look for likely places to escape the crowds. Alternatively find a nice lounge or restaurant and a corner table where you can take a deep breath and focus on a book or computer screen. I find that surfing the internet makes the hours between flights go much faster, and being “captive” in an airport often inspires some productivity in terms of checking emails or blogging. This entry was posted in Air Travel, Airport, airports and tagged Airport, minneapolis, minnesota, MSP. Bookmark the permalink.